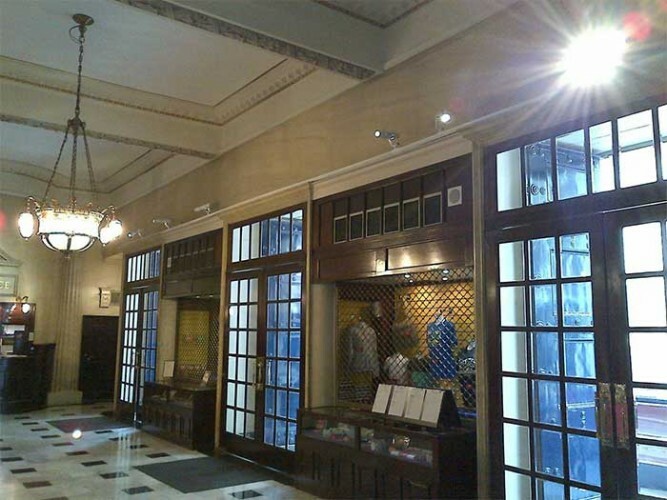 Philips Selecon's precise beam Aureol luminaires have been installed at London's Theatre Royal Drury Lane as part of a £4million restoration, personally overseen by Andrew Lloyd Webber. The Selecon Aureols – renowned as the choice for museums and galleries, retail and exhibition display, architectural accent and themed entertainment areas around the world – are providing a discreet solution lighting significant historic artworks in the sympathetic renovations. Specialist lighting supplier and systems integration company Stage Electrics supplied the Aureols to the theatre as part of a wider package of architectural lighting. "Andrew Lloyd Webber was personally overseeing the works and wanted the public areas of the Rotunda, Royal Staircases and Grand Saloon, all of which were part of the 1810 theatre, returned to their original Regency style," says Paul Roughton from Stage Electrics. 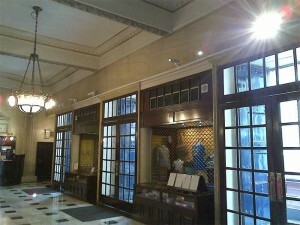 "He therefore required luminaires that could provide a well-hidden solution that was focusable and had shuttering to light old artworks that have been hanging in the theatre for many years. The Aureols have been supplied with UV glass to help conserve the paintings from further damage. "We supplied 14 Aureols in total all in white, 10 of the units were supplied with beamshapers and the remainder were supplied with snoot top hats. 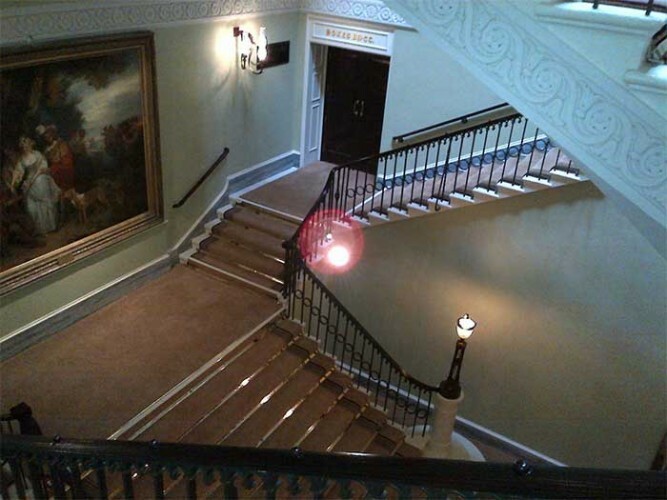 There was a mixture of track mount and ceiling rose, the track units have been used to up-light the foyer ceiling, others are up-lighting the underside of the main staircases as you go from lower rotunda to the Grand Saloon bar upstairs. I'm told that Andrew Lloyd Webber is delighted with the outcome, and so am I. Installation-wise they were easy to work with." The choice of museums, galleries and leading retailers around the world, the Aureol BeamSpot and Beamshaper are stylish housings for the popular MR 16 range of low voltage lamps. Elegant, simple and safe to use, the Aureol luminaires provide for the use of colour filters, diffusion spreader lenses, anti glare honey comb, snoot and barn door accessories. The Aureol BeamShaper includes a 26°-50° zoom lens and an optional animation motor accessory that can create dynamic movement effects. The Aureol BeamSpot and BeamShaper include individual Allen key lock off on both the pan and tilt focus, while an integral dimmer option offers the ultimate in individual intensity control. Lord Lloyd Webber unveiled the newly restored rooms to the press on 15 May, telling The Telegraph: "I am a firm believer in the importance of preserving Britain's architectural heritage for current and future generations to enjoy. It's my passion come alive." "We are delighted that the Aureol Beamshaper was chosen as the ideal solution to light the historic Theatre Royal, Drury Lane," says Grant Bales Smith, EMEA sales manager for Philips Entertainment. "This variable beam projection spotlight is the choice of many an architectural professional working in everything from museums and galleries, retail and brand image display to exhibition display, corporate image projection, architectural accent and themed entertainment." Philips Selecon has applied its well-respected optics to the design of the luminaire, which endows it with the ability to precisely shape and control the light beam. This enables high impact pattern projection and image movement can also be generated using the animation motor accessory."